Acid Demand - A titration test used to determine the amount of acid in a swimming pool to reach correct levels. Acid wash - A method that uses acid to clean the interior of a swimming pool. Algae - Aquatic organisms containing chlorophyll that can grow in colonies. Algae have the capability to conduct photosynthesis. The most common algae in swimming pools are green, black, and yellow. Algaecides - A chemical compound used to kill, control, and prevent algae in pools. Alkali - A base used in swimming pools to increase the water’s alkalinity level. Backwash - The process of reversing the flow of water to thoroughly clean dirt in a filter. Balanced Water - The result of keeping the five basic pool water components such as pH, calcium hardness, alkalinity, stabilizers, and total dissolved solids at the recommended levels. 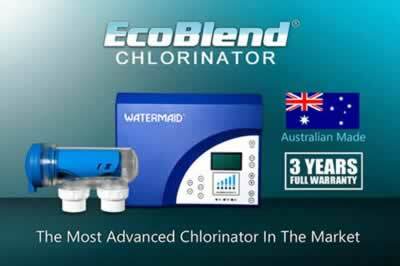 Chlorinator - Any kind of device that adds chlorine into pool water. Chlorine - Any type of chlorine compound used to disinfect a pool. Corrosion - The result when a pool's water is imbalanced. Corrosion may result to erosion, etching, or pitting of pool's surface and equipment. Efficacy - In swimming pool terminology, efficacy means the chlorine's effectiveness, which is affected by the water balance, sun, and chlorine. Filter - A device used in pools to remove particles in the water through a porous substance. Common types of filters are cartridge, sand, and diatomaceous earth. Filter medium - The material used in filters designed to remove suspended particles as water flows through it. Flowrate - The volume of water that flows past a designated point in a specified time. It is also known as litres per minute or lpm. Hard Water - The result when water is high in magnesium, calcium, or other salts. Hypochlorite - Family of chlorine used to disinfect, oxidize and sanitize pool water, such as sodium, calcium, and lithium. Oxidizer - Any compound that removes organic waste in the water without raising chlorine levels. Pump - A mechanical device powered by a motor used in pools for hydraulic flow and pressure for filtration. Reagents - A substance used in pools to test water quality. Sand Filter - A filter tank that uses sand as the filter medium. Titration - A method used to test the alkalinity of the water by adding a drop of titrant after another until a color change is observed. Zeolite - Microporous elements use in sand filters that provide filtration to 3 microns.